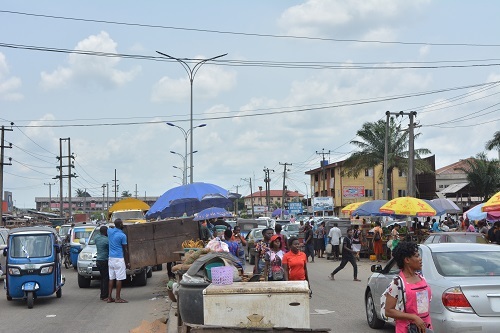 Traders along Slaughter Market, Refinery Road behind Delta Mall, Effurun in Delta State, on Tuesday March 26 evacuated their wares in utter frustration following the expiration of a two-week ultimatum given them by the Nigerian Navy to vacate their business premises purportedly belonging to the Navy. When Fresh Angle International visited the market at about 12:33pm, Tuesday March 26, the affected traders were seen moving their wares out of makeshift shops with forlorn faces and tears to the median of Refinery Road close to Delta Mall, while those selling cars were also relocating to other parts of Refinery Road, thus causing heavy gridlock in the road which connects Effurun-Sapele Road. The relocation notice handed down to the business owners by authorities of Nigerian Navy, reads, “(1) NOTICE! NOTICE!! NOTICE!!! : This is to inform all persons or group of persons doing one business or the other or any activity on the plot of land belonging to the Nigerian Navy at Effurun-Warri to relocate from the land within two weeks of this notice or not later than Saturday 16 March 2019. (2) All are advised to comply with this directive”. The traders who spoke to Our Correspondents, appealed to Naval authorities to give them at least 6months to enable them resettle to different locations.